I’ve been working with clients for a few years now and am always intrigued by the ideas people come up with. It’s really fun to put a few minds together and see the result of a powerful brainstorm. I’ve been really impressed with many of my clients for their hard work, dedication, and committment to succeed. Keep up the great work and Expect Success! One of my current clients is really using his talents and skill-set to make things happen. 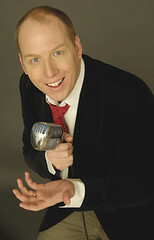 He is a professional radio and TV announcer by trade and has interviewed some of the stars, including ShoeMoney. As we’ve talked about his ideas and worked on staying focused, I feel things have really come together for him. One of his ideas that I think many of my clients could benefit from is a teleseminar about getting free advertising from the radio. Offline marketing is acceptable for an online site 🙂 I know some of you may have never thought of that concept but offline marketing really does work for a website too. Radio and TV Talk Show host Mark Kaye will show you why spending money on expensive radio and TV advertising is a total waste for you and your business. Especially when there are BILLIONS of dollars worth of FREE air time that radio and tv producers are STRUGGLING to fill! Do you have a product, service, website, store, book, blog, opinion, invention, or theory that you want to publicize? You can reach millions of people all over the world from the comfort of your own home and without spending a dime. In this EXCLUSIVE Teleclass, Mark Kaye will show you just how easy it is to become a credible “expert guest” for radio and TV shows across America and the World! He will teach you how to refine and pitch yourself so that you are guaranteed bookings! He will explain step-by-step how producers decide which guests make it on the air and which don’t. Plus, he will tell exactly what to do to turn your publicity into sales and secure repeat appearances. Learn from a radio insider. Mark has booked hundreds and hundreds of guests. He reads thousands of press releases. He knows what works and what doesn’t, and he can make you a radio and tv publicity star! I know spots are limited so sign up today. I’ll be on the call for sure. Congrats to Mark for doing what he loves to do and seeing the fruits of his labor. I plan to use the information I learn from this call for my cheerleading photography website and other sites too. I’ll keep you posted on how it works out. Nate! I am so excited about having some of your readers in the class! It is going to be an amazing experience for anyone who wants to get some radio and TV exposure. Nate: Another interesting idea to think about. Keep up the good work. I’ve been online too long I guess. I’ve forgotten about radio advertisements. I myself try to come up with interesting ways to advertise on the web and post them on my blog. Shameless plug http://AllMyNonsense.com. I’ll be sure to sign up for this one.